Thin mozzarella cheese and salami slices are wrapped in a cone shape around mustard-coated artichoke hearts for easy Italian-inspired appetizers. 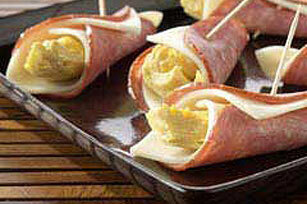 Wrap 1 cheese slice and 1 salami slice around each artichoke quarter to resemble a cornucopia. Secure with toothpicks. Remove toothpicks before serving. Add 2 Tbsp. KRAFT Grated Parmesan Cheese to the artichoke mixture before using to make cornucopias. Cornucopias can be prepared ahead of time. Refrigerate in airtight container up to 24 hours before serving.